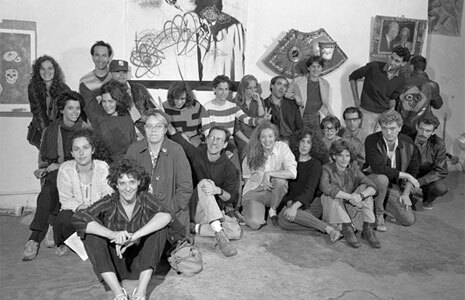 From its origins, the Lower East Side art space ABC No Rio had strong connections to the artists’ group COLAB (members pictured here, at No Rio in 1984). Front: Andrea Callard. Second row: Kiki Smith, Sally White, Tom Warren, Becky Howland, Jolie Stahl, Bebe Smith, Walter Robinson, Alan Moore. Third row: (left) Julie Harrison, Ellen Cooper, (right) Maria Sutcliffe, Matthew Geller, (standing) Jim Sutcliffe, Bobby G. Back row: Jody Culkin, Brian Piersol, Joseph Nechvatal, Cara Brownell, Cara Perlman, Brigitte Engler, Doug Mulaire, Mindy Stevenson. Photo by Peter Sumner Walton Bellamy. The early history of ABC No Rio is now online. 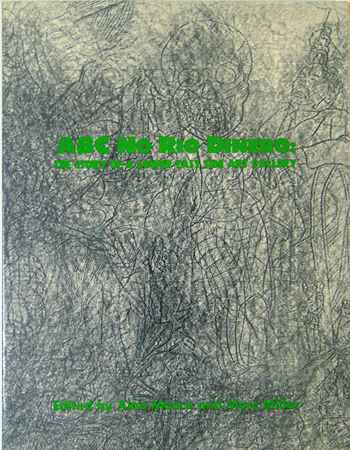 Alan W. Moore & Marc H. Miller, eds., ABC No Rio Dinero: The Story of a Lower East Side Art Gallery, 1985. It’s a bit of a shock, walking by 156 Rivington Street and seeing a completely empty lot where, for more than 35 years, the alternative art space ABC No Rio had stood. 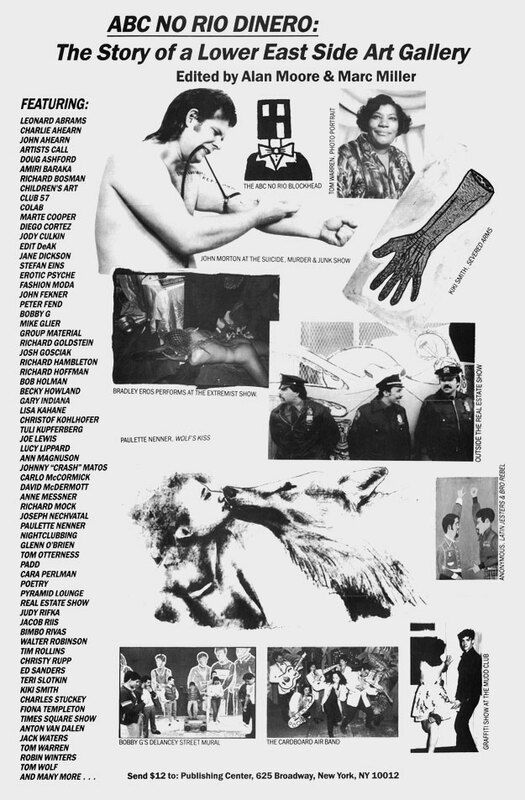 No Rio’s quasi-accidental origin story dates back to 1980 and the “Real Estate Show,” illicitly organized by the artists’ group Colab in a broken-into city building on nearby Delancey Street, from which they were evicted by police on opening day. The dilapidated Rivington Street tenement subsequently became the city’s conciliatory offer to the artists. ABC No Rio has persisted ever since, hosting workshops, exhibitions, concerts, and other programming. Having recently raised money to rehabilitate the cheaply built old building, No Rio’s directors ultimately realized it was more practical to build a new structure instead. The 1985 book ABC No Rio Dinero: The Story of a Lower East Side Art Gallery, edited by Alan W. Moore (a founder of the gallery) and Marc H. Miller (now of Gallery 98), recounts No Rio’s early history against the 1980s background of do-it-yourself artist-organized initiatives like COLAB, Fashion Moda, and Group Material, and the rise of the East Village art scene. The gallery’s location, in a working-class barrio far from the mainstream art world, encouraged artists to rethink their work and its audience. But the artists who flocked to the neighborhood also fed into the complex process of gentrification. Despite such contradictions, No Rio never lost its mission, always identifying as an open collective that emphasized community, camaraderie, and mutual support. ABC No Rio’s remarkable future can be attributed in part to Steven Englander, its director since 1999, and in part to the anonymous million-dollar donation that set in motion the rebuilding campaign. The two-year construction project will begin in September. Meanwhile, No Rio remains active, organizing exhibitions “in exile” at kindred Lower East Side spaces: most recently, “Taking It to the Streets” at the Museum of Reclaimed Urban Space (just closed) and “ABC No Rio Zine Library in Exile” at the Clemente Soto Velez Cultural Center (through 2017). Poster for the ABC No Rio Book, 1985. Designed by Keith Christensen, Marc Miller, and Alan Moore.